Hi all! Lindsay Lajola here on the blog today. 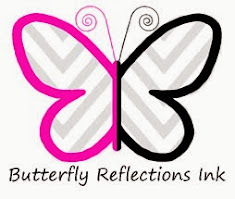 I recently purchased some Catherine Pooler Inks from the Butterfly Reflections, Ink store and I couldn't be more excited about them. I ordered the colors from the Spa Collection: Zen Garden and used them on these cards today. I loved them so much that I just placed another order for the Party Collection: Life of the Party ink pads as well. Vanessa has all of them in her store along with all of the refills so you're all set! I also ordered a bunch of geometric stamps from The Stamp Market in order to make colorful, structured backgrounds. For this card I used Patterned Polka Dot Stamp Set from The Stamp Market along with Shea Butter CP Ink, Seafoam CP Ink, and Midnight CP Ink. I stamped the circles overlapping and flowing from one corner diagonally to the other corner and added in the "X" stamps for some additional interest. The inks stamp really nicely, even with solid images and cleaning off the stamp between colors is a total breeze. 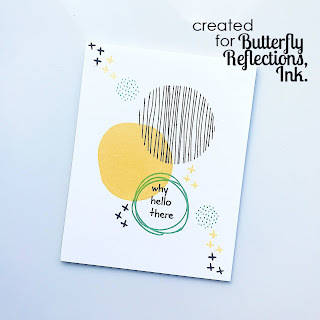 For this card I used the Painted Polka Dot Background Stamp from The Stamp Market. 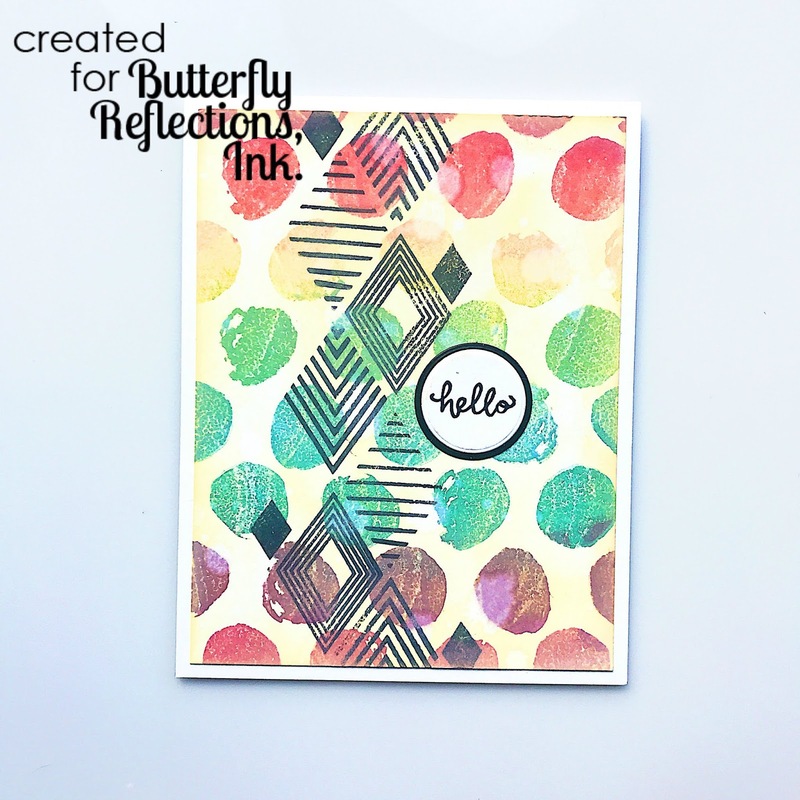 I used my MISTI to stamp the background as I was planning on using multiple colors to stamp a rainbow background. From top to bottom, I used Rose Petals CP Ink, Polished CP Ink, Shea Butter CP Ink, Seafoam CP Ink, Skylight CP Ink, Stone Blue CP Ink, and finally Sugared Lavender CP Ink. I used a towel to blot off the edges of the coloring to try to avoid harsh lines and have a smoother transition between colors. Using a Mini Ink Blending Tool I blended some Shea Butter CP Ink along the edge for a more distressed look. I then used the Detailed Diamonds Stamp Set from The Stamp Market to spice up the background a bit using Midnight CP Ink. 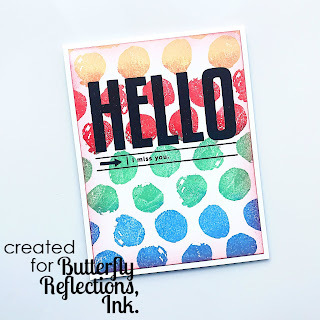 I stamped the "Hello" sentiment from the Detailed Diamonds Stamp Set, die cut it with a circle die and backed it with a piece of black cardstock also die cut in a slightly bigger circle. Here is a another card using the same technique with the Painted Polka Dot Background Stamp, along with Shea Butter CP Ink, Polished CP Ink, Seafoam CP Ink, and Stone Blue CP Ink. The edge was blended using Polished CP Ink and Mini Ink Blending Tools. 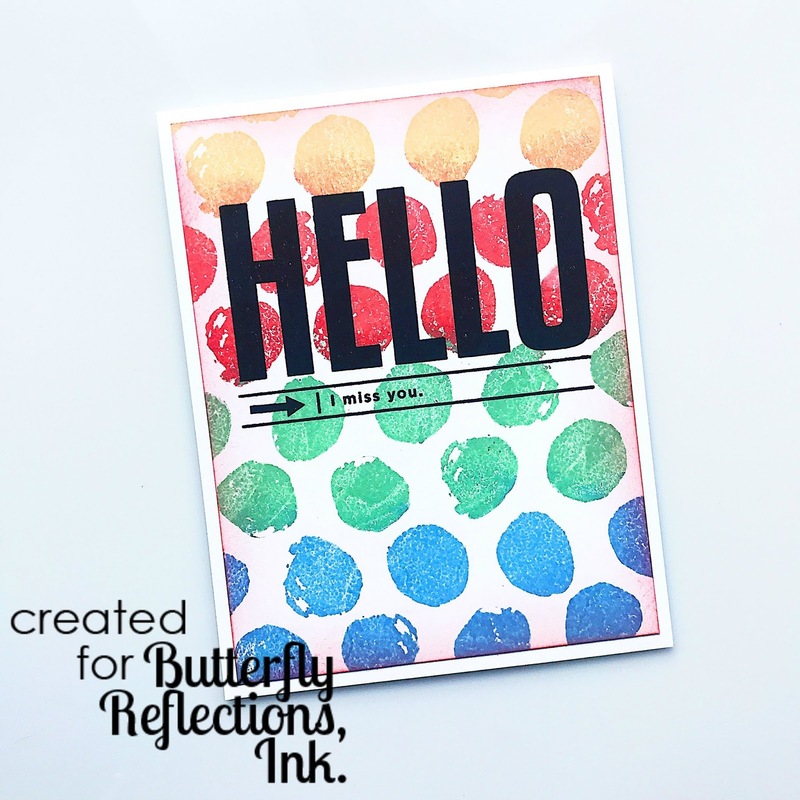 I finished the card simply with the Hello Hello Stamp Set from The Stamp Market. 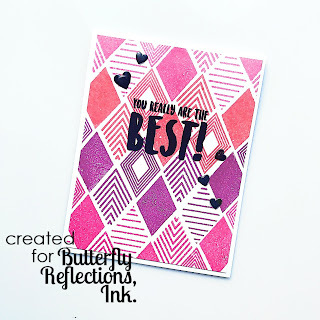 For this cards I used the Detailed Diamonds Stamp Set to create a background with Rose Petals CP Ink, Polished CP Ink, and Sugared Lavender CP Ink. 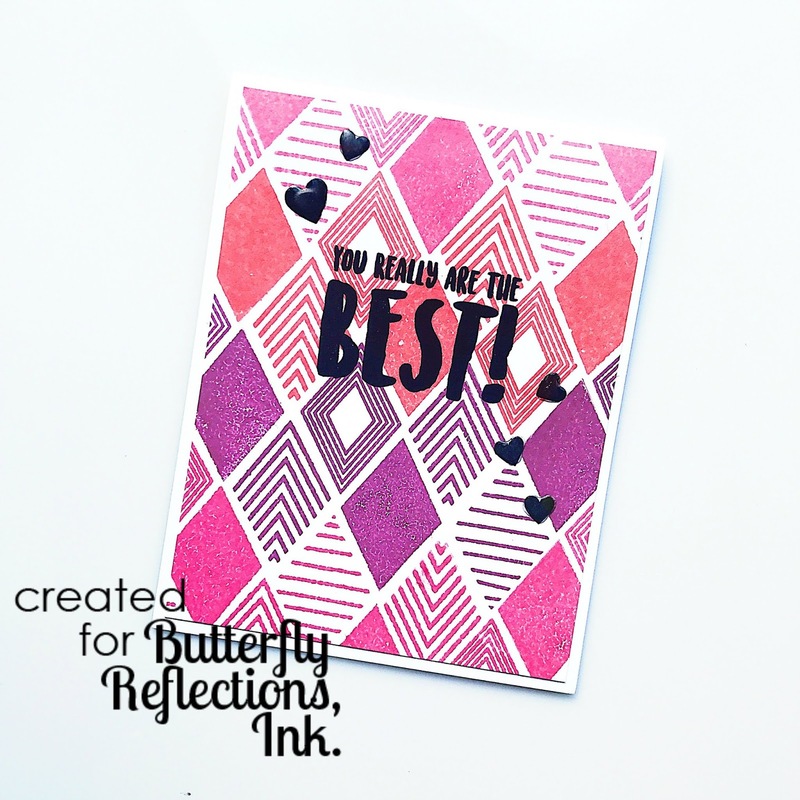 The sentiment is also from The Stamp Market and is called You Are My Fave. The sentiments in this set are nice and bold so they can stand up against a busier background. All in all I'm loving these Catherine Pooler Inks and they're encouraging me to do some basic stamping, which I really love but haven't done too much of recently. I hope that you've enjoyed my cards and maybe I've even inspired you a bit. Have a great rest of your week!